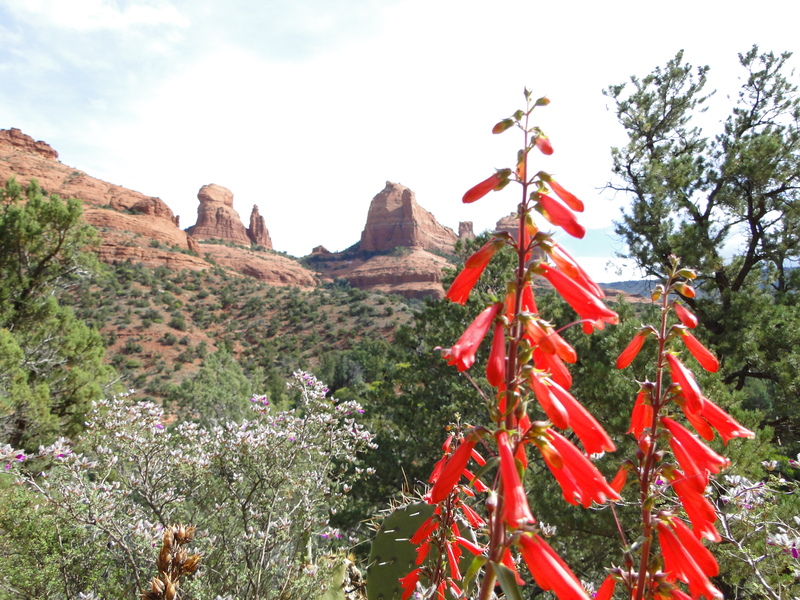 After arriving in Sedona, Arizona at dusk I did the scenic drive to acquaint myself with the surroundings while enjoying the dazzling views. The skies turned into a serene blue dashed with streaks of red and orange created by the fading sunset. Instead of finding a place to eat and continue on to the Grand Canyon, I decided to spend the night over and hike at least of the trails. The following morning I chose to hike the Munds Wagon Trail which is four miles in length one-way. Perhaps because of the weather conditions on that day, few people were hiking. I heard and saw just a few of the all terrain and safari-like jeeps that tour through the Schnebley Hill Road that sometimes crisscross and intersect with the Munds Wagon Trail. I was fortunate to have been there early in the Spring because some hikers have noted that in the Summer the road is “infested” with jeeps. Luckily that was not the case that day and for most part the trail runs far enough from the road that the vehicles are rarely heard. The weather was rather unstable that morning going from sunny to cloudy to rain and sunny again a couple of times. I had hiked for about two miles when it started to rain. For about one mile I hiked under the rain until the skies cleared and the sun came back. 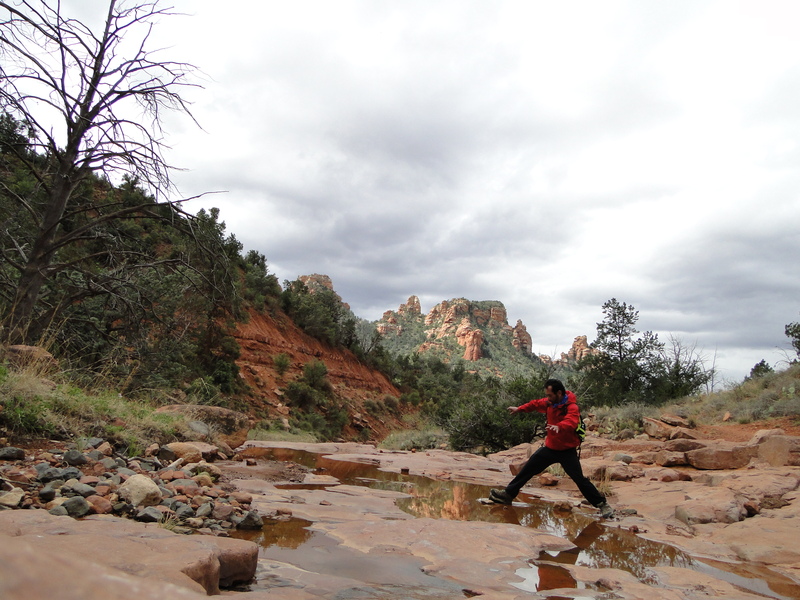 Throughout my eight miles hike that day the weather pattern switched back-and-forth several times. Prepared with a water proof jacket, plenty of water and food, the weather constant changes did not bother me at all. 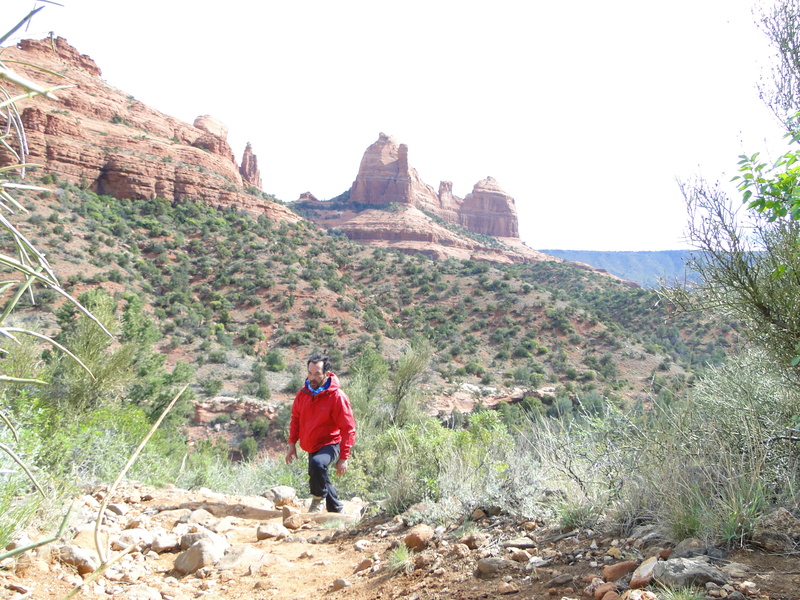 It did make it a bit challenging as parts of the trail became a little slippery in the more strenuous sections, although overall this is an easy and pleasant trail to hike. 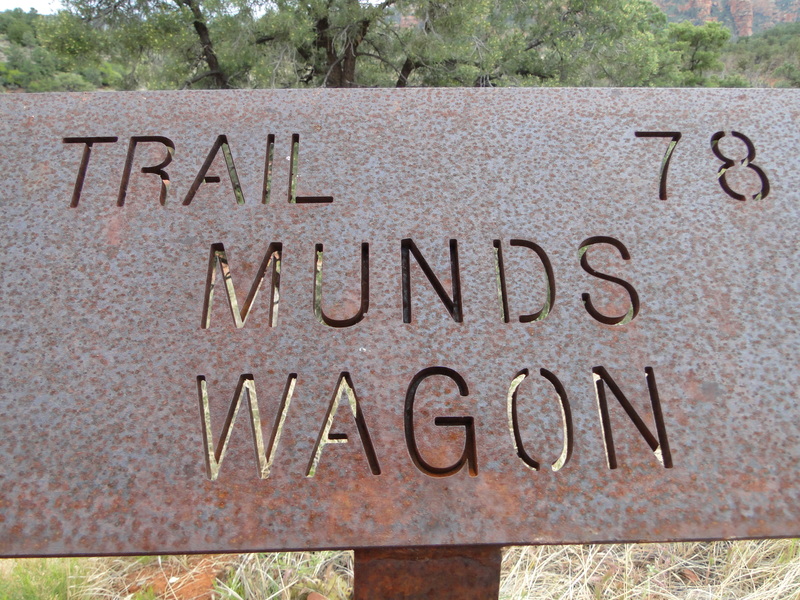 The Munds Wagon Trail crosses the intermittent creek in the Bear Wallow Canyon, ducking in and out of trees and slick-rock washes opening up to incredible views of Mitten Ridge and Cow Pies. 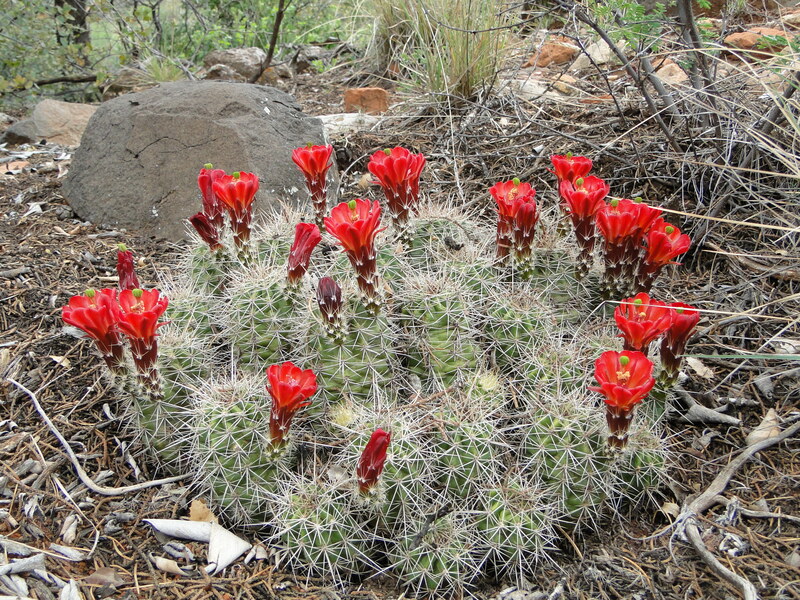 Alongside the trail cactus blossoms nested in the rocks are reminders of the rich desert ecosystem contrasting with the red rocks. As you hike further in the views only get bigger and better! This is a paradise for mountain bikers who share the trail with hikers and indeed, I encountered more bikers than hikers. I initially had planned to hike the in-and-out eight miles only, but on my way out I could not resist the temptation to do a portion of the Hangover Trail. I guess I felt quite gnarly and willing to test myself after having already done more than five miles. It might have been quite a bit more than five or six miles because, although I rarely hike off trails, this is a place where I felt that I could safely wander off the trail. 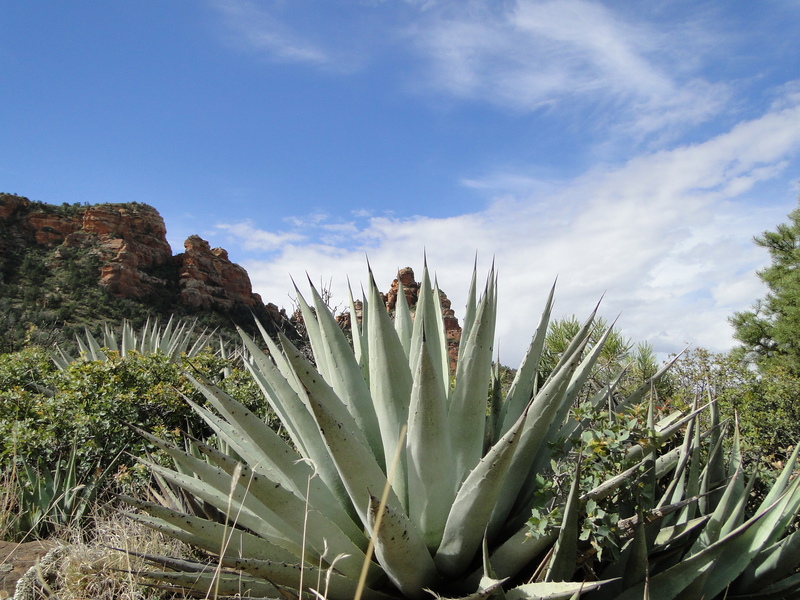 There are plenty of rocks and plateaus or mesas that offer amazing views. There were also a few spots where I realized that I had lost the trail and had to go back to find it. The trail is marked by cairns that are distant enough from each other to make it confusing leading you to easily get off the trail without noticing; specially if it is raining and you have the trail all to yourself. 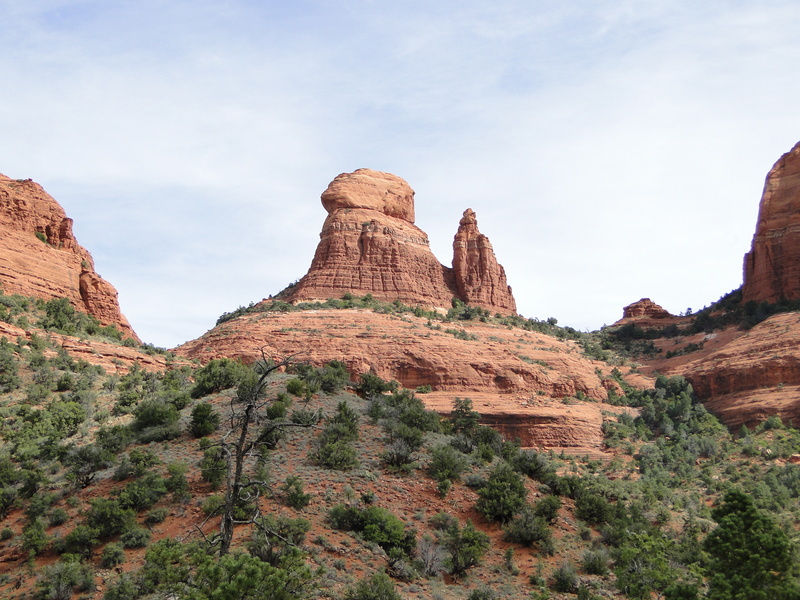 Getting back on track is not difficult because the landmarks in the surrounding landscape rise in front of your eyes throughout the entire hike. The Hangover Trail is a lot more demanding than the Munds Wagon Trail and a bit slippery on a rainy day. 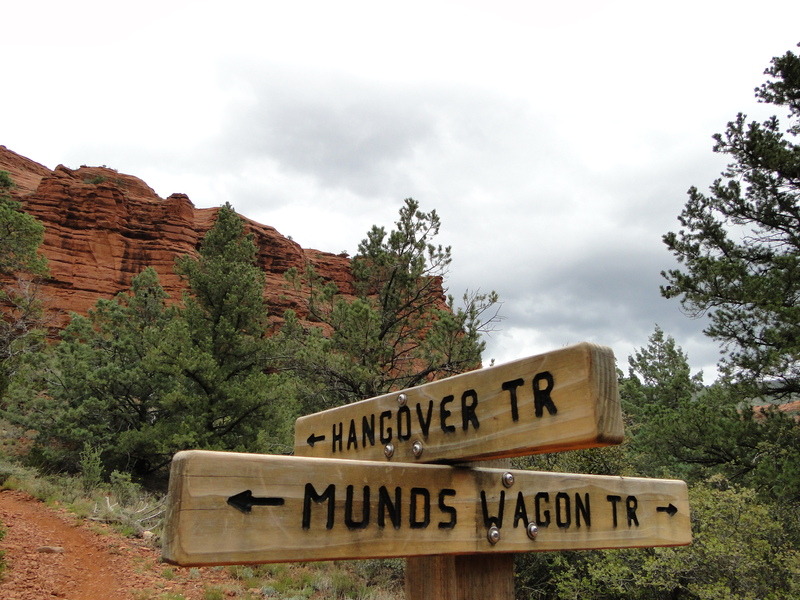 While the Munds Wagon Trail is a gradual uphill climb to a 1200 feet elevation, the Hangover Trail presents a more challenging abrupt climbs at some sections. I only hiked on for about a mile and a half when I decided to turn around to go back to complete the Munds Wagon Trail. 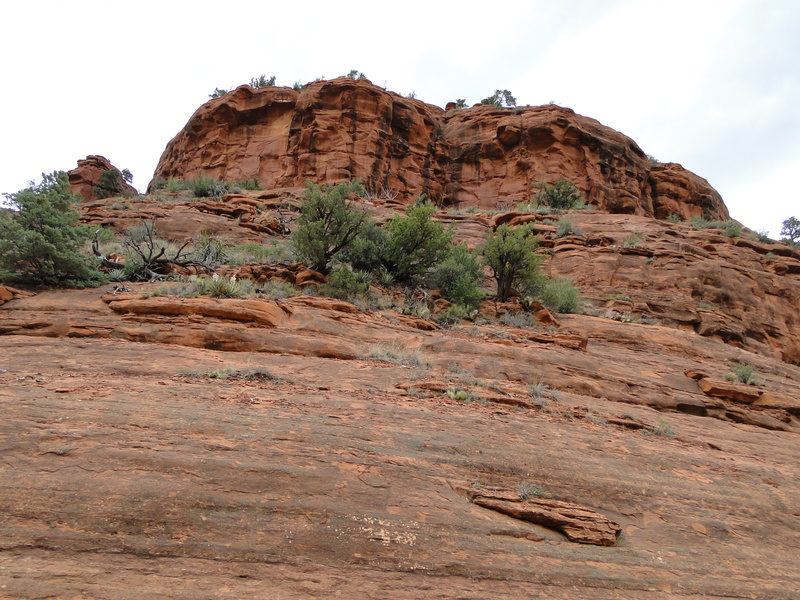 At that point I realized that hiking eleven miles before leaving Sedona to the Grand Canyon was quite enough for what was supposed to have been just a stopover.